Professor Daniel CW Ho is currently professor at the Faculty of Design and Environment, The Technological and Higher Education Institute of Hong Kong (THEi). He is a building surveyor and facilities manager by profession. Professor Ho’s key research interests are on building quality and performance assessment, facilities management, and planning and development. He taught construction, maintenance technology and management, planning and development control, and facilities and asset management modules at undergraduate and postgraduate levels. He published books and chapters in planning and building development, change in use of land, as well as building maintenance and dilapidations. He has published extensively in the areas of facilities management outsourcing, building maintenance, collective actions in housing management, urban renewal, built heritage revitalisation, etc. Professor Ho is active in services to his profession and the community. 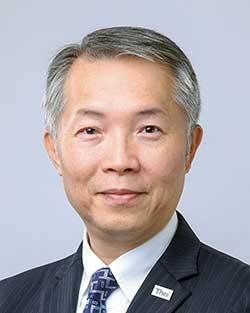 He has served on various government committees, councils, and boards of professional institutions, including the Hong Kong Institution of Surveyors (HKIS), Hong Kong Institute of Facility Management (HKIFM), and the Royal Institution of Chartered Surveyors (RICS).